Lanturn in game: 518 Who? Important notice! Pokemon Lanturn is a fictional character of humans. 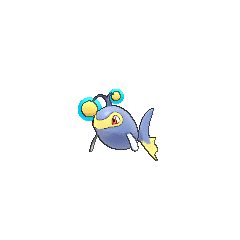 Lanturn (Japanese: ランターン Lantern) is a dual-type Water/Electric Pokémon introduced in Generation II. It evolves from Chinchou starting at level 27. 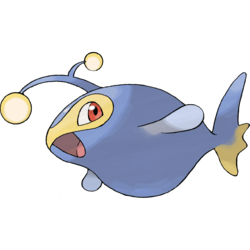 Lanturn is a large, blue fish-like Pokémon with small, blue pectoral fins. It has a yellow "mask" over its red eyes. The lower half of its caudal fin is yellow and has jagged edges. A Y-shaped antenna with a teardrop-shaped orb on each tip sprouts from its back. This structure comes from a modification of its dorsal fin. These orbs contain a colony of bacteria that compose a chemical reaction, which generates electricity in a similar fashion to that of a battery. 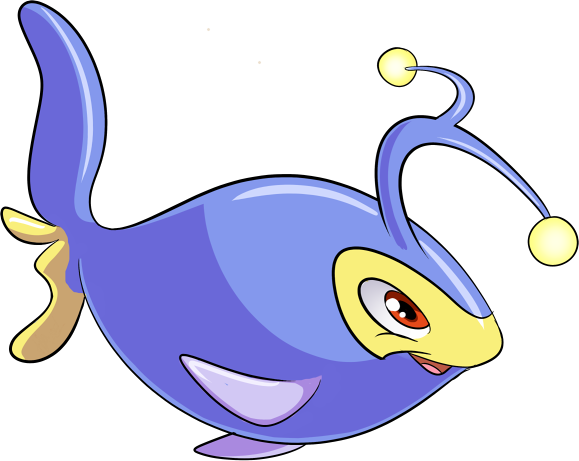 Lanturn uses the bright part of its body to lure fish prey. It then blinds the prey with an intense burst of light, and swallows the immobilized prey in a single gulp. Lanturn inhabits the oceanat depths of over three miles. 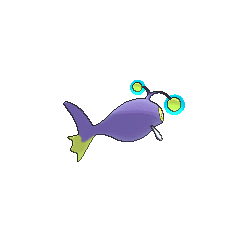 Lanturn first appeared in The Mystery is History. Its Trainer Oliver was using it to play with a Baby Lugia named Silver. Lanturn also appeared under the ownership of Dorian in Just Add Water where he used it to battle against Misty. In Lapras of Luxury, Lanturn's supersonic waves helped Naomi locate singing voices of Lapras. One also appeared under Kyle's ownership in Pruning a Passel of Pals! while participating in the Wallace Cup. It defeated Ash's Buizel. A Lanturn appeared in The Legend of Thunder! where it was seen swimming in a lake. Multiple Lanturn were among the Pokémon living in Lake Slowpoke in Enlighten Up!. 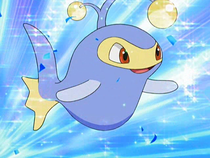 A Lanturn was used by a competitor in the Tour de Alto Mare, a water chariot race, in Pokémon Heroes: Latios & Latias. Multiple Lanturn also appeared in Destiny Deoxys and Pokémon Ranger and the Temple of the Sea. Multiple Lanturn appeared in Kalos, Where Dreams and Adventures Begin!. A Lanturn appeared in a fantasy in Clemont's Got a Secret!. Multiple Lanturn appeared in Going for the Gold!. EP220 Lanturn Ash's Pokédex Lanturn, the Light Pokémon. The light that emits from its tentacle-like limb shines bright enough to illuminate the bottom of a deep sea. DP078 Lanturn Dawn's Pokédex Lanturn, the Light Pokémon and the evolved form of Chinchou. Lanturn's antennae light is strong enough to penetrate the ocean and any seam of the water's surface. An ice sculpture of a Lanturn Pryce made appeared in Irked Igglybuff and Curmudgeonly Cleffa. In Lovely Lanturn, Misty uses a Lanturn to fight Suicune in the Tohjo Falls. In The Last Battle XIII a Lanturn was one of the Pokémon sent to help the fight in Ilex Forest. 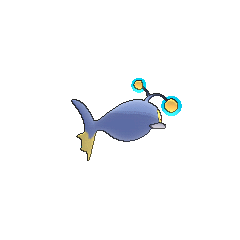 This Pokémon uses the bright part of its body, which changed from a dorsal fin, to lure prey. Should you peer into the ocean at night and see a light shining like the stars, that is Lanturn. This Pokémon flashes a bright light that blinds its prey. This composes an opening for it to deliver an electrical attack. Moves marked with a superscript game abbreviation can only be bred onto Lanturn in that game. 51%-100% HP Am I too bright? Sorry, sorry. 26%-50% HP I'm getting down to about half HP now. Level up Leveled up! My lamps blaze even brighter! 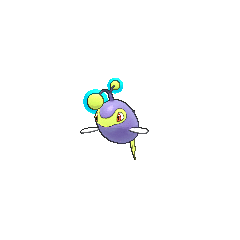 For other sprites and images, please see Lanturn images on the Bulbagarden Archives. Lanturn has the highest HP base stat of all Electric-type Pokémon. Lanturn shares the same category with Ampharos. They are both known as the Light Pokémon. It is based on an anglerfish, more specifically the footballfish, although it shares some similarities with dolphins. It is also possible that Lanturn's origin contains a small piece of the Hellenistic fake, Apollo. He was the fake and his animal was the dolphin. Lanturn is a corruption of lantern. It may also be a combination of lantern and turn (as in "turn on the light"). Cantonese Chinese 電燈怪 Literally "Lamp freak". Mandarin Chinese 電燈怪 / 电灯怪 Diàndēngguài Literally "Lamp freak".